As the Tarleton homecoming festivities commence, and many are preoccupied with activities and planning, we wanted to remind everyone to be safe and responsible so the week is as enjoyable as possible. It’s no secret that student drinking has become a problem on college campuses across the country, so it’s smart to be prepared to make responsible decisions. 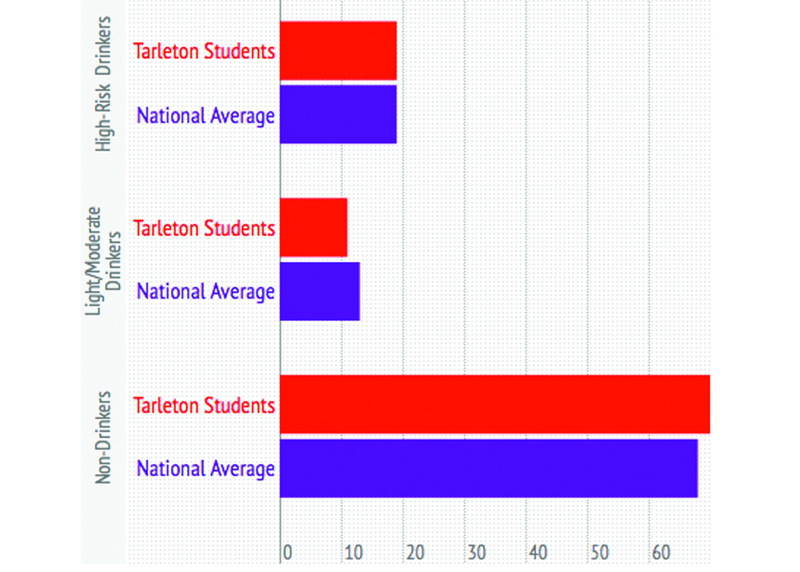 Tarleton statistics from 2011-12 obtained from the Student Counseling Center in conjunction with AlcoholEdu. According to Dr. Stephanie Robertson, director of the Student Counseling Center, students seek counseling for a great number of drinking-related problems. Tarleton Police Chief Justin Williams says that there was a large increase in alcohol related calls-for-service in the first two months of last year’s fall semester. “In particular, we noticed an increase in Bosque Crossing in comparison to other residential facilities,” he said. This is reflected in the 2012 Annual Security Report (see bit.ly/tarletonclery), where you can see the number of liquor law violations spiked from a low of 42 (cases resulting in arrests plus cases resulting in disciplinary action) in 2011 to a high of 94 in 2012. Dana Moore, assistant dean of students, said the increase of that type of violation could be partially accounted for by the record number of incoming students in 2012. “The population growth among the new students to the university contributes to the spike,” she said. During transition week the fall semester of 2012, the Student Counseling Center took the AlcoholEdu results from the record-breaking incoming class, and compared them to the national averages for alcohol consumption. According to the Tarleton website, all first time freshmen who have 30 or fewer hours are required to take the AlcoholEdu course. Students taking the survey were able to classify themselves as nondrinkers (meaning they had no drinks in the past two weeks), light to moderate drinkers (1-3 drinks in the past two weeks for women and 1-4 drinks in the past two weeks for men), or high-risk drinkers (4 or more drinks in the past two weeks for women and 5 or more drinks in the past two weeks for men). Seventy percent of the participants classified themselves as nondrinkers compared to the national average of 68 percent. Light to moderate drinkers made up about 11 percent of the class as opposed to the national average of 13 percent, and those who identified themselves as high-risk drinkers made up 19 percent, which was the same as the national average for the same year. The City Limits promotions and marketing director, Kourtney Oldham, says they have taken many precautions to ensure the safety of their customers, but refrain from calling the police every time an incident occurs. Oldham says she personally has noticed an increase in student drinking problems. Williams said the spike that occurred last year was definitely due to the larger number of residents on campus and not more alcohol abuse, but nonetheless advises students to be cautious.